In the tunnelling industry the generally accepted verification of the excavation process is through meas-urement of the time dependant surface settlement that results from the excavation and lining processes. TBM View has been specifically developed on major recent UK tunnelling projects to support and verify EPB tunnelling operations in real time as tunnelling progresses. This is a reactive process and can be too late where catastrophic over-excavation occurs. It is also time dependent so that final settlement continues long after completion of tunnelling operations. Hassan Armand explains how TBMView, developed on major UK tunnelling projects, offers a way to support and verify EPB tunnelling operations in real time as tunnelling progresses. TBMView collates available information from TBM and tunnel sources and displays them in real time allowing immediate reaction to anomalies in excavation and lining operations. In this way it operates as a pro-active system. Key parameters are displayed graphically against pre-set trigger levels making interpretation and response simple and providing an overview of the complete operational process. As can be seen from functional decomposition diagram all components of TBMView are integrated and fed from single real-time data from time segments arriving at the site to becoming a Ring in the tunnel and beyond. Every advancing and Ring building can be replayed and reproduced from the site to the ring from stored historical data for fault diagnosis and events. TBMView was developed for use in a permanently manned control room where tunnelling operations and tunnel safety are permanently monitored. Engineers in the control room can respond directly to excavation problems as they occur. In general, TBMView can accept information from any source and display it in a simple mode that is immediately understandable to engineers involved in the operations. TBMView can be adapted to any special requirements set forth by the client in processing data from site sources such as conveyor systems, water treatment plants, grout batching plants, and cooling installations. The key components of the system are discussed below. The TBMView system interrogates the face earth pressure sensors to obtain hydrostatic gradients for the material in the excavation chamber. From these the environmental pressures and the degree of filling of the chamber are evident (Fig 2). TBMView indicates the face pressures at different levels that are plotted against target values for these parameters. The consistency of the face pressure regime and its value during excavation is immediately recognisable (Fig 3). The face pressure value during ring building is also important. 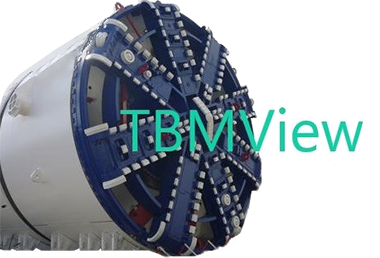 TBMView monitors the face pressure continuously and displays it as a succession of excavations and ring build cycles. TBMView takes information from belt weighers and gives a graphical representation of the quantity of spoil removed as each stroke proceeds. This is displayed against a background mask indicating various trigger levels. Face material density is a variable parameter input by the site engineering department. A screen indication is available during excavation (Fig 4) so that problems can be addressed quickly. TBMView displays pressure and flow information from each grout line together with the total grout volume injected (Fig 5). This information can be used to justify the adequacy of the grouting operation from both a pressure basis and in respect of the total volume injected. It can also indicate where problems exist on individual injection lines. In general, conditioning of the excavated material is necessary by injection of either foams or polymer-dosed fluids through the cutterhead of the TBM. The amount of fluid injected and its effect are tracked by TBMView, which displays the foam injection ratio (FIR) and the polymer injection ratio (PIR) as excavation proceeds (Fig 6). The totals for injected foam and polymer fluids are displayed in tabular form on the ring report sheet. In addition, TBMView includes graphical representations of the cutterhead torque and tabular values for the specific energy of excavation that give insight into the effects of the soil conditioning regime (Fig 7). For any given vertical or horizontal alignment there is a theoretically correct articulation setting for a TBM with an active articulation. TBMView can give the articulation ram differential readings to the TBM operator in the instruction information. Conversely, the actual articulation settings being implemented by the operator can be shown on the control room screens and displayed in terms of the implied tunnel radius. The centre of thrust during each excavation cycle is recorded, which gives an indication of the suitability of the articulation setting (Fig 8). For any given vertical or horizontal alignment there are theoretically correct axial ram differential extensions for each stroke. These can be given to the TBM operators to aid the excavation process and can be interrogated by TBMView to indicate the current radius being followed by the shield. Initial studies of the geotechnical environment, third party assets, and tunnel alignment generate the basic mode of operation and target face pressures along the tunnel route. Initial operating instructions are generated and agreed by the contractor and client (Fig 9). These are issued and tunnelling commences. The excavation operation is monitored by engineers from the control room where anomalies in parameters are highlighted and responded to. Ring excavation reports are produced for each excavation (Fig 10) and a shift summary is generated (Fig 11). The excavation reports are reviewed together with surface settlement results at a daily shift review meeting where the operating instructions are ratified or modified by an agreement between the contractor’s and client’s representatives. New operating instructions are issued as necessary to the tunnelling teams. Additional graphical representations provided by TBMView include ring plane correction assistance generated from either manual or automatic input depending on the TBM configuration (Fig 12); management of precast segments including record of installation, damage, and repair (Figs 13); an overview of tunnel and TBM environmental safety; TBM route mapping, geologically in section and in plan for surface infrastructure (Fig 14); and TBM consumables usage.